Buy More Recycled Plastic Studio Bags Save More! Citrus Studio Collection Assortment contains 150 bags Total: 50 Piccolo (12" x 10" x 4"), 50 Mezzo (16" x 15" x 6") & 50 Colossal (22" x18" x 8") bags. Made from 2.25 mil HD plastic. Green Way ® Eco-Friendly Packaging. Made in the USA. Hot stamping not available on assortments. Our Recycled USA Studio Plastic Bags have wide bottom gussets which allow the bags to stand up on their own without cardboard inserts. 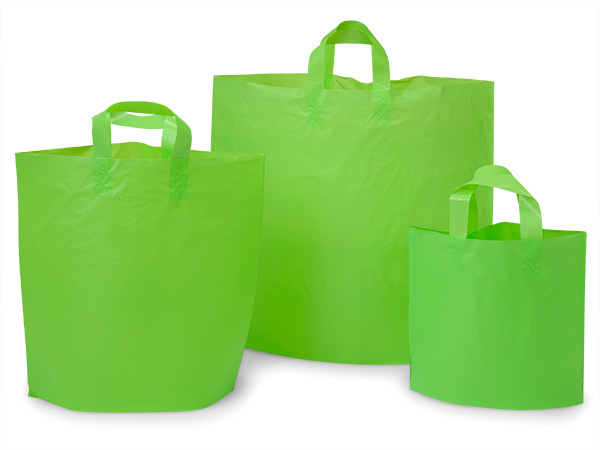 These upscale 2.25 mil Polyethylene plastic bags have a thick 6.5 mil handle. Made in the USA in a top rated environmentally efficient facility from 25-100% recycled materials.